My love affair with wine began sixteen years ago, in 2002. That's a long time, almost two generations in the wine world. Right at the start of my wine romance, Al Hashulchan, a local foodies magazine, ran an article in its wine section about the Rhone Valley. Something in the tasting notes and the background story hooked me and my first major purchases were based on the article's recommendations. Over the next few years I kept hunting down Graillot, Cuilleron, Chapoutier (I realized from the start that Guigal was out of my reach). That's more or less all we had in Israel at the time. I still buy them whenever I can, although the fact that the local Cuilleron importer has taken me off the mailing list has placed purchases from that producer on a hiatus. Sixteen years really is a long time. Enough to change the map a few times over. 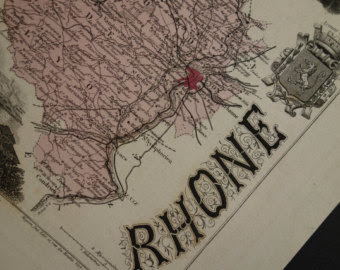 The Rhone, especially the north, has grown ever more trendy and popular. As the venerable names became more expensive, the new guard marched right in. And some lesser known, older names just leaped out of the cellar to become marquee names. Vincent Paris is one of the new guard in that he created his own domain, but he also inherited vineyards from his grandfather and was trained by his Cornas legend of an uncle, Robert Michel. In that sense he has real ties to the older generation. 2015 is the most praised vintage for the north Rhone since 2010. Paris made such great wines in the much less acclaimed 2014 that it's a shame the only Cornas currently available in Israel from 2015 is the entry level Granit 30. The thing about young Syrah, as you'll see in all the notes here, is that it's very vital and crunchy/juicy, almost the most joy that such a tannic red grape can sustain. And Cornas is a tannic appellation, even though Paris is very good at taming the tannins, meshing them and the fruit in a rusty, mineral finish that is very food friendly but also works well alone. Syrah from the wrong side of the tracks, sorry, river. This is Syrah as a forward nubile, plump and juicy and floral, a dead ringer for a Saint Joseph of the fresh and fruity kind, pure fun. Not complex but with a refreshingly peppery finish. This cost 12 euros at a supermarket in France, not even one within the Rhône, so ideally it should cost 70 NIS in Israel. But a good price point was never an ideal to die for, for some. In a similar vein, Jean-Luc Colombo, les Collines de Laurie, Syrah, 2016 is also a very good introduction to the North Rhône. It is made of young Cornas vines. The vinification is the same as the more ‘serious’ wines of the house, other than being bottled after only 7 months in barrel. At 9 euros in French chains, comes across more as Crozes than a Cornas. It’s very fruity, its tannins silky, when you can sense them at all. There are hints of minerals and pepper. In the end, it's just simple fun, but never underestimate the value of fun. Another wine from the Collines Rhodaniennes IGP is the Michel and Stéphane Ogier, Syrah d'Ogier, 2016, which is sourced from young vines from a flat plain. Wine Route is carrying Ogier again and selling this for 140 NIS. It carries itself better than the Cuilleron, the tone is a littler darker and more complex , carrying black pepper with hints of meat. An initial hole in mid-palate fills up within an hour, delivering juicy, saline flavors. The best of the three IGPs. Like almost every North Rhone producer, Ogier has a Saint Joseph. The La Passage, 2015 is suave, ripe and juicy, on the modern side. How modern? It's just a little too suave and too ripe, the tannins too sweet and soft. The black pepper aromas are nice, but the nose on the whole lacks depth. The contrast with the less prestigious d'Ogier only emphasizes the disappointment. Boutique importers IPVinum (aka Aron Teller and Uri Caftori) carry just a single North Rhone producer. This is the basic Cornas cuvee and this is all they carry, besides a Syrah based Cote de Rhone (a good go-to wine in local restaurants). The winery recommends drinking it at four years port-vintage, more or less. In a vintage like 2015, which is described as the sort of vintage where nature and weather smiled upon the Rhone, the rustic wildness of Cornas is almost too easily tamed here. The fruit is broad and friendly, with fairly complex and nuanced aromas of black pepper, olives, flowers, even meat. 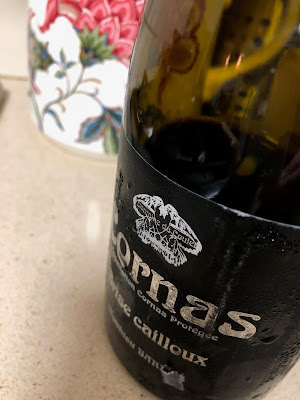 The tannins are soft and integrated, asserting themselves more with air and leaving a savory aftertaste, quite a tasty one, that scratches just enough to remind you this is, after all, Cornas. I'm familiar with the 2012, but this exceeded my expectations. Given the quality of fruit and winemaking, as well as how charming this is with patient airing, I'd buy this every vintage and hope to try the more upscale cuvees.